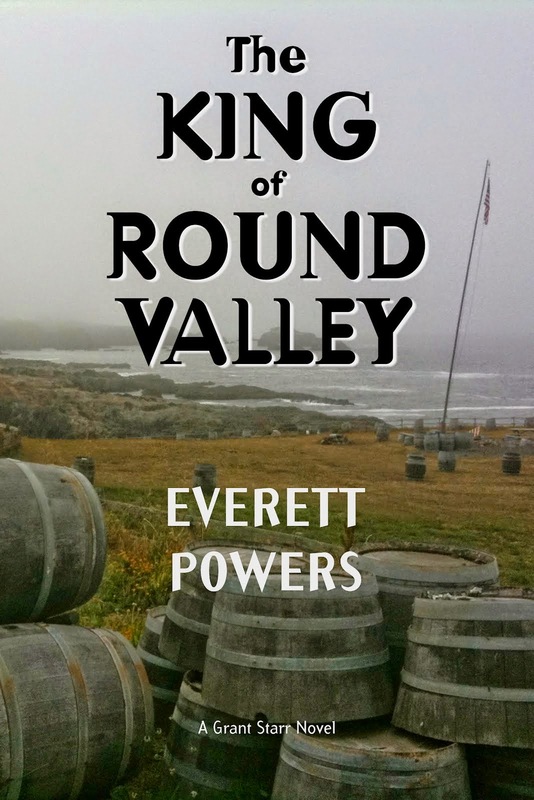 This past Monday I attended a Portuguese “bloodless” bullfight with two of my sons, in tiny Stevinson, California, a dairy town twenty-five miles south of where I live. My next Grant Starr novel will open with one of these bullfights, so naturally I wanted to see one. It was one of the most exciting events I’ve ever attended. Tradition bullfights, where the bull is stabbed or killed, have been outlawed in the United States for many years. “Bloodless” bullfights are legal in several states, including California. Here, they are legal only when part of a religious event. Good thing for us the Portuguese Catholic community has religious events from April to October; there are twenty-to-thirty bullfights every year. I’ve lived in the San Joaquin Valley since 1963 yet never knew of these bullfights. Instead of being stabbed in the back, as happens in Spain and Mexico, the bulls have a Velcro pad that performers attach short and long flags to. You can see them in the pictures above and below this text. The only blood I saw came from the busted lip of a forcado. More on forcados in a minute. In the event I attended, the cavaleiros, horse-mounted bullfighters, placed three short banderillas, the flags, on each bull while riding their first horse. They changed horses and placed three longer banderillas, then left the arena. There were no matadors, bullfighters on foot, at this event. When the cavaleiros were finished, the trumpets blared and the forcados leapt over the wall and entered the arena. Our hostess’s daughter, who is Portuguese-American, says she attends twenty bullfights a year. She, like everyone in the stands under fifty, chatted with friends or played on her cell phone during most of the bullfight. But when the forcados took center stage; everyone paid attention. Forcados are badass bull wrestlers. 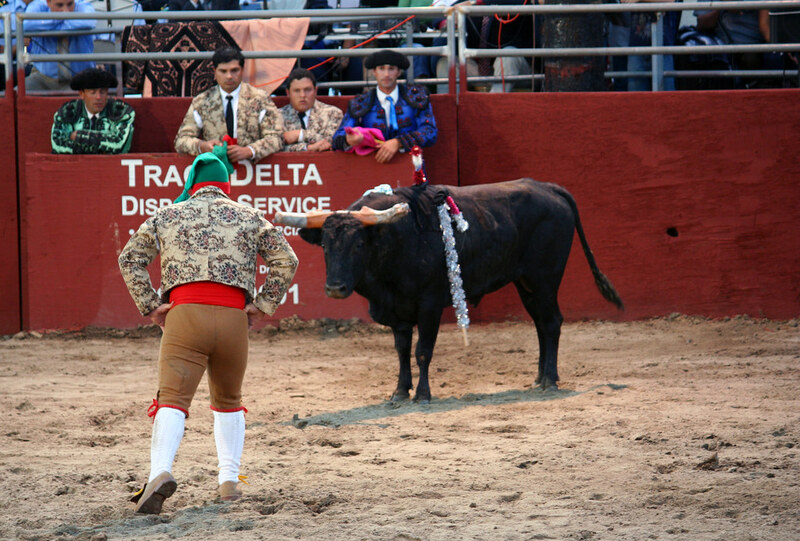 A forcado taunting a bull. They are all crazy, but the one in the picture, with the elf hat, is by far the craziest. 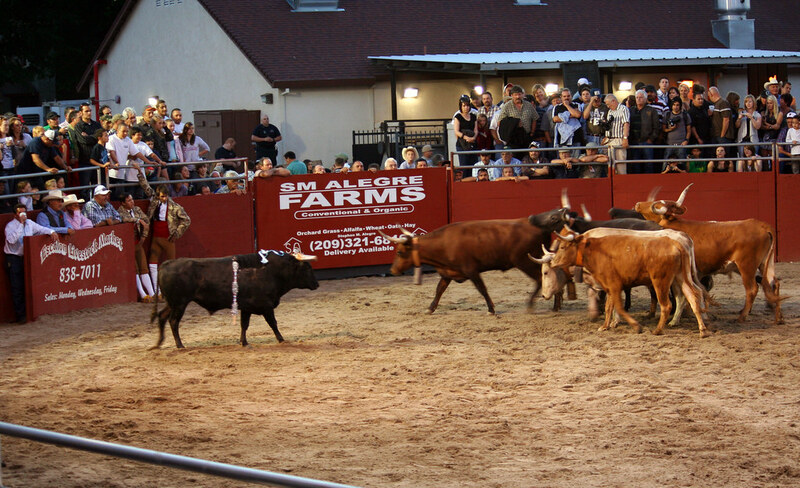 Eight forcados enter the arena to wrestle the bull into submission. They form a line, with the elf-hat-wearer in front. Elf Hat approaches the bull alone, as depicted in the photo. He calls out “Touro! Touro!”, “bull” in Portuguese. Well, bah! Instead of my blathering, watch this short video I made with my iPhone. It’s best viewed in full-screen mode. That group’s bad luck to have drawn the meanest bull in the show. It took them three attempts to subdue it. Animal fans are wondering what happens to the bull after the bullfight. It either goes out to pasture, as a stud, or it goes to the slaughterhouse, where all cattle end up. These bulls are bred to fight in bullfights and they get only one appearance. Bulls are smart. 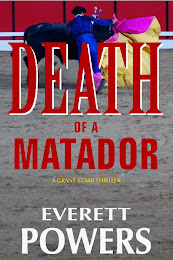 If they were to come back a second time they’d know not to go for the muleta, or cape: they’d go for the matador. And they wouldn’t chase the horses because they’d know they couldn’t catch them. That would be a boring show. There’s more, but I’ve used up my time. I think there’s another post or two here. Or three. The experience has made me rethink my work-in-progress. *Apologies to the Portuguese language, which I don’t speak. I’ve probably mixed Spanish with Portuguese. *On a personal note, my oldest son speaks Portuguese and had a ball chatting with his neighbors. Because he doesn’t look Portuguese and speaks the language funny, everyone wanted to know if he was Brazilian. The other son only came because he’d pulled the front bumper off his truck backing out of his parking stall and couldn’t work that evening. He didn’t regret it; we had a blast. This post was super-informative and exciting! 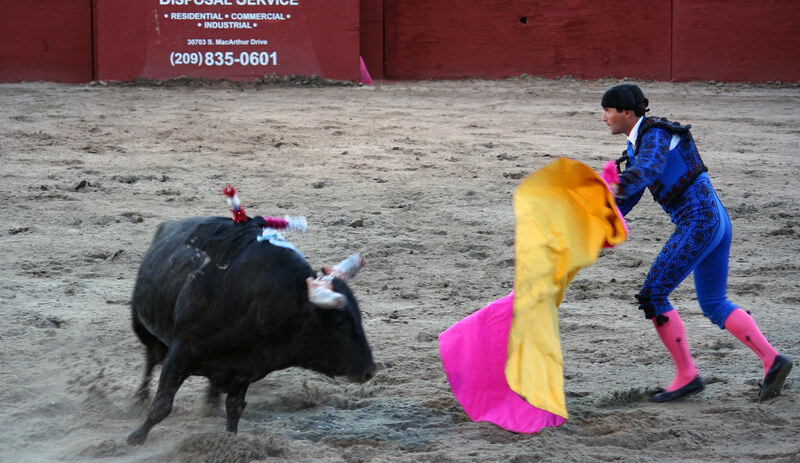 I loved the picture of the forcado taunting the bull -- even the bull looks like he's thinking, "You're crazy!" Not quite the bullfights you've seen, I'm sure. No need for forcados in Spain. I spent Tuesday evening with the Amadores De Merced, watching them train and sharing a BBQ dinner. 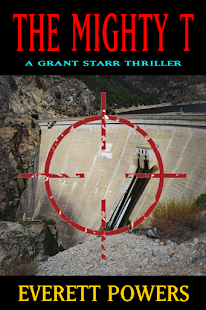 There's a whole novel hiding with that group. 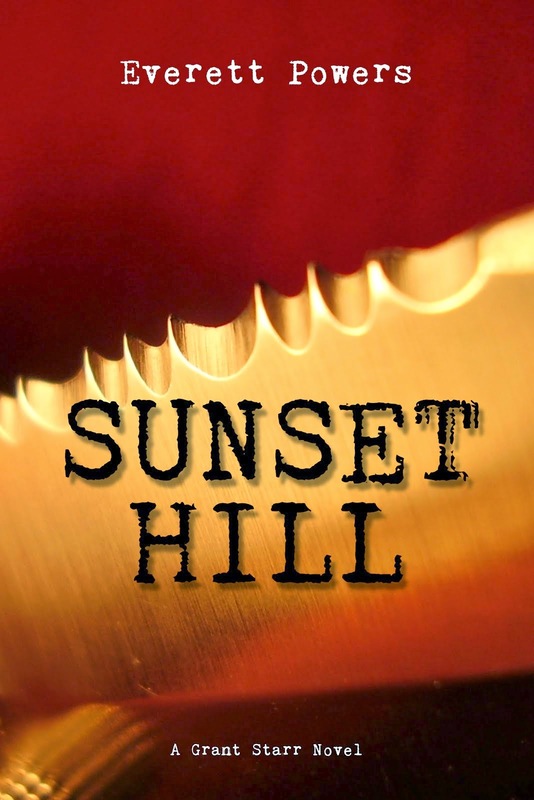 I just think I could pull it off as it would be more of a literary novel than genre fiction. But it's haunting me. What an interesting experience! I've never see a bullfight (bloodless or otherwise), but I have been to a rodeo to see the bull riding. That was very exciting as well. Sounds like you got some good stuff for your WIP. Thank you ladies. Well worth the $20 price of admission. Certainly more fun than any Six Flags park.